Free Hot Tub* and Pool is a huge savings. Retail is $15/day/person. $60 for a group of 4 per day. It is offered complementary and available when open (not available in spring and fall times). Ski Trip Preserver provides coverage should you need to cancel your trip before you even depart or if your trip is interrupted. The plan also provides coverage for trip delay, baggage delay, lost or stolen personal items including sporting equipment such as skis and snowboards, emergency accident and sickness medical coverage and emergency evacuation as well as 24-hour assistance services.Restrictions apply. 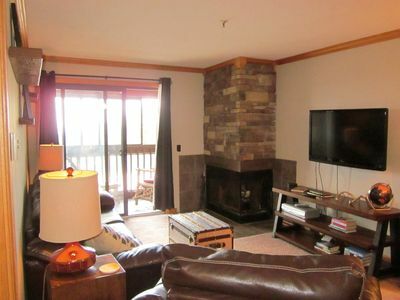 Unit #117 is a 1 bedroom/1 bath, ski-in and ski-out condo located on the first floor of the Mountain Lodge Condominiums with great views. 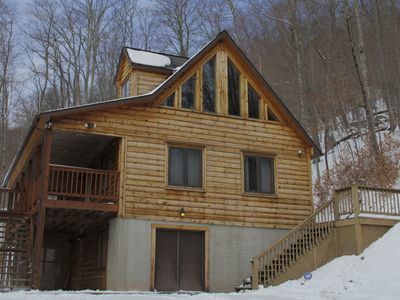 Close to Snowshoe Village, city center, restaurants and dining. 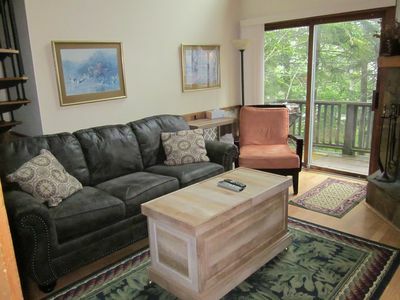 You’ll love this condo as this is one of the few deluxe condos in Mountain Lodge. Once you arrive, park in the security-guarded lot and you won’t have to drive again until you are ready to leave. The Village restaurants and shops are only a short walk away! 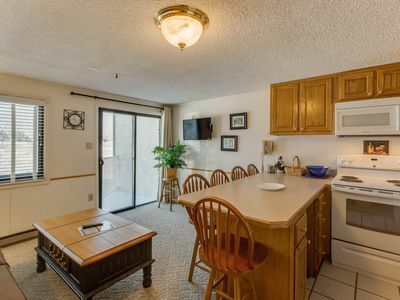 This condo has 1 bedroom and 1 full sized bathroom. Bedroom features a queen-sized bed, and flat screen wall-mounted tv. 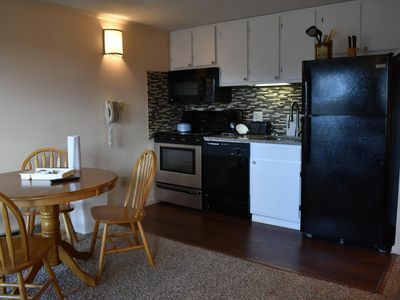 The kitchen is renovated and has all stainless-steel appliances, granite countertops and a glass backsplash. 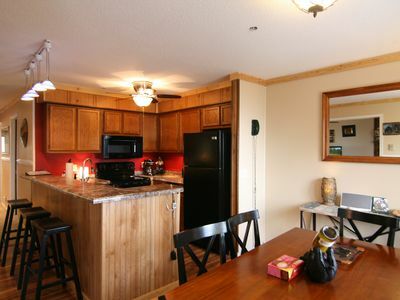 It has full size stove/oven, refrigerator, dishwasher, microwave, coffee maker and toaster, crockpot, blender too. Plus, all of the pots and pans, dishes and utensils you could ever need to prepare your own meals. Cozy living room with a fold-out couch and oversized stuffed chair. 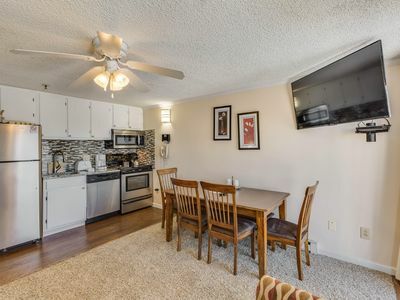 50" TV wall mounted flat screen TV, DVD player in living room. Dining area seats four people. Coin operated laundry facilities are located down the hall by the elevators. 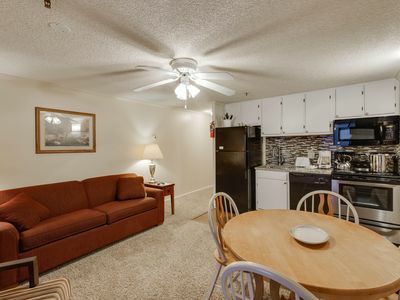 The unit also has an air conditioner if it gets hot. 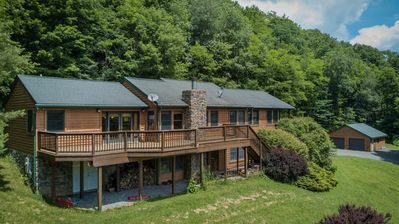 - Includes use of Split Rock Pools and hot tub and is based on scheduled dates, and may be closed in the spring and fall. Please note that no bikes or animals are allowed in the building. Items Included: 6 (Dinner plates, Salad Plates, Coffee Cups, Cereal Bowls, Water Glasses, High Ball Glasses), 4 wine glasses, 3 serving bowls, covered baking dish with lid, Colander, flashlight, (large, medium and small cooking pots), 2 medium skillets or 1 large, Cookie sheet or Pizza Pan, 9x13 baking pan, 8x18 baking pan, 6( serving spoons, teaspoons, salad forks, dinner forks, dinner knives), 4 steak knives, Bottle opener, Cooking plain Spoon, Cooking Slotted Spoon, Cork Screw, Cutting Board, Electric Can Opener/ Manual, Grater, Measuring Spoons, Measuring Cup, Mixing Bowl Set, Spatula, 2 Water Pitchers, Veg Peeler, 3 Pot Holders, Coffee Maker, Toaster, 4 Ice Trays if no ice maker, Blender, Mixer, Crock Pot, Knife Set, Alarm Clocks, 20 Clothes Hanger. Note that the Mountain Lodge itself is an older building. Minor improvements are ongoing. However, the building needs updating. 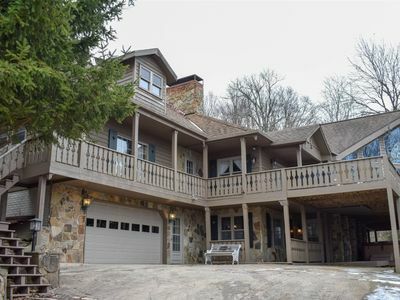 Most people love Mountain Lodge because of location, common areas (none of the buildings on Mountain has huge common areas like Mountain Lodge). 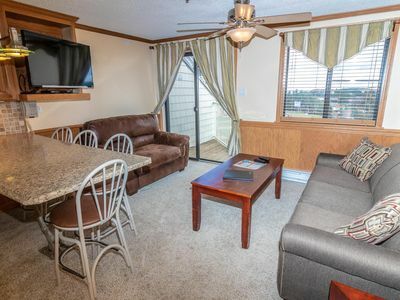 My condos are updated and comfortable and guests love them. 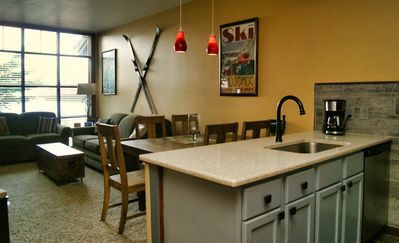 OTHER CONDOS - Snowshoe Vacation condos / Snowshoe ski vacation has 18 condos in Mountain Lodge. 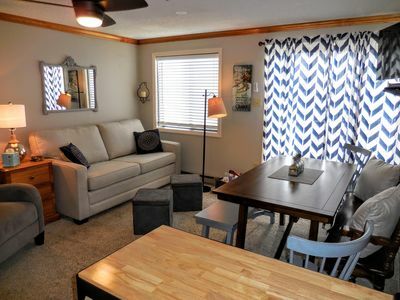 You can book these condos for groups/family gatherings/weddings. 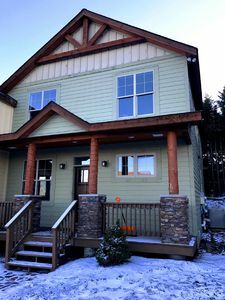 We have upgraded our condos because we care about our customer experience. The location is PRIME! 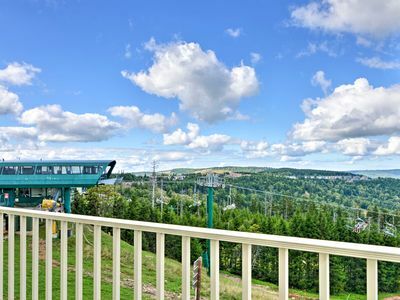 Ball Hooter lift is a high speed quad lift that serves the Village area. It is just outside Mountain Lodge back door. 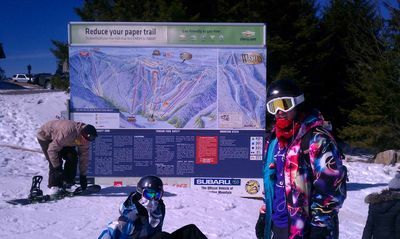 We are truly ski in, ski out.The beginner slope, Skidder, is also just a few steps away. We are close enough to the lift that you could come in for lunch or a break. 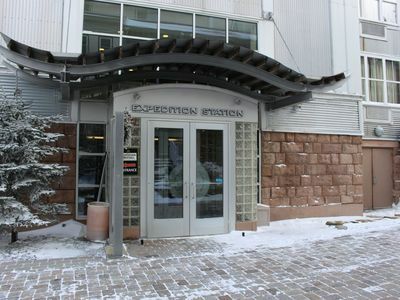 Mountain Lodge is also close to the shuttle that will take you to night skiing at Silver Creek. Split Rock Pool is also just down the steps and a few yards away. This is an awesome pool. 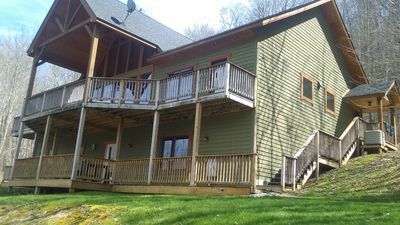 It has two outdoor hot tubs, and the pool features lots of toys and slides indoors, and a heated outdoor pool. 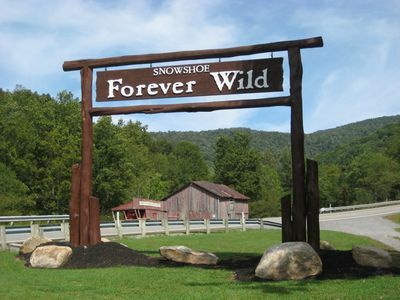 Snowshoe Village is a collection of stores, restaurants, bars, and coffee shops. Ski Trip Preserver: Great way to preserve you ski vacation. Please email us to add Ski Trip Preserver to your reservation. 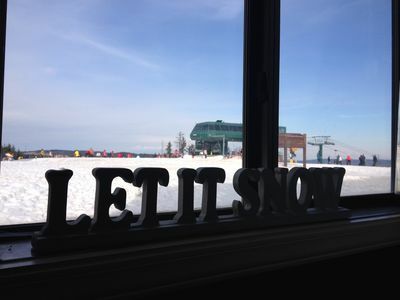 BEST LOCATION @SNOWSHOE! IN THE VILLAGE!